If you know me, you know I love authors. I love to listen to them talk about their books, about their writing process, about their view the world, about the books the love to read. I’m also loyal to authors. If I like a book, I will continue to follow that author to see what they will come up with next. If you know me, you also know I’ve been in a reading slump – planning a wedding and getting married takes a lot of brain power and time! So when Nicole Baart, (an author I’ve followed since I read her book The Moment Between in 2009) posted on Facebook that she was looking for members of a “street team” for her newest book, The Beautiful Daughters, I applied! The opportunity to read an Advanced Reader’s Copy, offer it for a giveaway, and then to receive a copy of the book when it is published on April 28, 2015 – I love stuff like that! I was tickled to be chosen for her Street Team and for The Beautiful Daughters to be the first book I read in 2015. Bonus: She sent her favorite chocolates, book marks, signed book plates, and homemade soap made receipt of the package even sweeter! Below is the description of the book from the Digital Catalog at Atria Publishing (a branch of Simon and Schuster), the tentative cover design, and a little info about Nicole Baart, the author. Below that is my review and details on how you can get your hands on my ARC!! From the author of Sleeping in Eden, described as “intense and absorbing from the very first page” (Heather Gudenkauf, author of The Weight of Silence), comes a gripping new novel about two former best friends and the secrets they can’t escape. Adrienne Vogt and Harper Penny were closer than sisters, until the day a tragedy blew their seemingly idyllic world apart. Afraid that they got away with murder and unable to accept who they had lost—and what they had done—Harper and Adri exiled themselves from small-town Blackhawk, Iowa, and from each other. Adri ran thousands of miles away to Africa while Harper ventured down a more destructive path closer to home. Now, five years later, both are convinced that nothing could ever coax them out of the worlds in which they’ve been living. But unexpected news from home soon pulls Adri and Harper back together, and the two cannot avoid facing their memories and guilt head-on. As they are pulled back into the tangle of their fractured relationships and the mystery of Piperhall, the sprawling estate where their lives first began to unravel, secrets and lies behind the tragic accident are laid bare. The former best friends are forced to come to terms with their shared past and search for the beauty in each other while mending the brokenness in themselves. 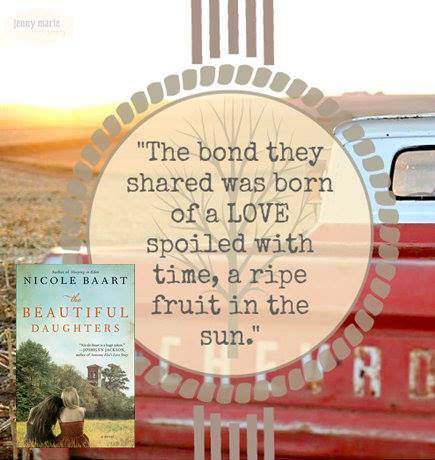 Nicole Baart’s lush and lyrical writing has been called “sparkling” (Publishers Weekly), “taut and engrossing” (Booklist), and “evocative and beautiful” (Romantic Times). 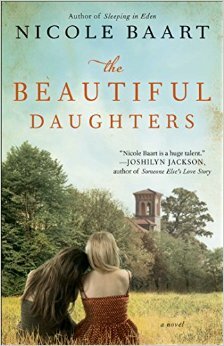 The Beautiful Daughters is another exquisitely rendered, haunting story that will stay with readers long after the last page. Nicole Baart is the mother of four children from four different countries. The cofounder of a non-profit organization, One Body One Hope, she lives in a small town in Iowa. She is the author of seven previous novels, including, most recently, Sleeping in Eden. Find out more at NicoleBaart.com. I really enjoyed this book. I love books with rich character development. I love beautiful descriptions. This book has all that, plus a suspenseful plot with insight into how tragedy affects people. The book also tackles sensitive topics, but I don’t want to spoil the suspense. This book is about young adults who meet at a small college in Blackhawk, Iowa. Adri and her brother Will grew up on a farm in Blackhawk, and David grew up at Piperhall, a mansion down the road. Along with Harper and Jackson, The Five become fast friends and spend most of their out-of-school time playing grown-up at Piperhall and when Harper suggests a trip to commemorate their college graduation and mark endings and new beginnings, they are unaware of the tragic event that will happen and change their lives forever. They scatter – Adri to Africa and Harper into dark relationships – and are called home five years later when the matriarch of Piperhall dies. This is a page-turner and I’m so thankful it was the first book I read in 2015! Now, to get your hands on my Advanced Readers Copy, please COMMENT BELOW with the FIRST BOOK YOU READ OR ARE READING in 2015! If you share this blog post on Facebook or Twitter (and share the link), you will get extra entries! I’ll pick a winner WEDNESDAY JANUARY 28. When I was young (5th grade? 6th grade?) I loved “Where the Red Fern Grows,” but I haven’t read it since then, so it’s hard to say it’s a favorite, because when I think of books with animals in it, my mind goes immediately to “Life of Pi.” I listened to that book on audio first and simply fell in love with the story. I loved the cadence of the reader, the description of the animals in the life boat, the floating island, and the horror of the story. A few years later I read the book for book club (at my insistence) and I enjoyed the story just as much and loved talking about it with everyone (although most didn’t share my love for the book). #29 on my list of 40 things was: Go to Michael Feldman or Garrison Keillor. Michael Feldman and Garrison Keillor have weekly entertainment radio shows on public radio. I have listened to Garrison Keillor since I was introduced to the show when I was about 12 by my aunt and uncle. I don’t listen religiously, but whenever I am in the car or at home and remember, I will turn on The Prairie Home Companion,which is taped in St. Paul, MN or NYC. Michael Feldman’s show, “Whad’ya Know?” was introduced to me much later – in the late 90s – and it is less musical and more interview/comedy based with local color. It is taped in Madison, Wisconsin. On May 31, 2007 Garrison Keillor came to a small artsy town about 20 miles from where I lived, so I got tickets and went with a bunch of friends. He recorded the show on a baseball field outside and the weather was perfect, the guests were colorful and fun, and his show was fantastic. It would be fun to see him at the Fitzgerald Theatre in St. Paul sometime and I hear he’s going to retire soon, so I’ll have to get on that. Posted in About Book Blogging, General Book Talk	| Tagged 40 Day Challenge, animals, Authors, Birthday, Boof, Garrison Keillor, Humor, Life of Pi, lists, Literature, Michael Feldman, prairie home companion, whad'ya know?